Fisher's Popcorn and Candy Kitchen Salt Water Taffy, MMMM! 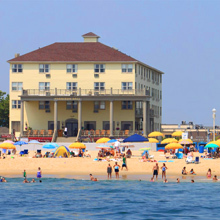 We invite you to step off our spacious front porch and indulge in the deliciousness of the Ocean City Boardwalk! Availability is limited, so please call us at 410-289-6222 or add to your Online Reservation after booking your room to book this package today!